In September and October of 2011 Manjula and her husband traveled to the most remote parts West Bengal for three weeks to film a documentary about healthcare in the region. 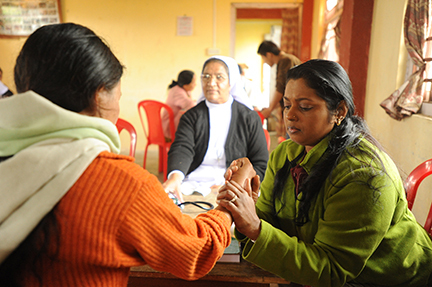 While there, a local health clinic operated by ECTA International hosted a Health Camp in Kaffer, West Bengal. Manjula joined several doctors from around the area. Everyone donated their time to treat villagers from the region- many too poor to ever consider going to a hospital or visit a doctor on their own. People walked through the monsoon rains for up to six hours for the opportunity to see a doctor- many for the first times in their lives. Another program that Manjula created was through St. Joseph’s Convent in Git Dubling, West Bengal. Here for several days Manjula taught health practitioners from the region about indigenous medicinal herbs and their uses. Many of the practitioners had heard of Ayurveda, but they weren’t aware that access to the herbs was as simple as looking in their own backyards.